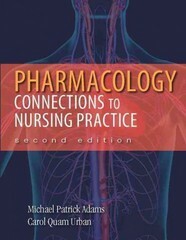 Pharmacology 2 Edition PHARMACOLOGY: CONNECTIONS TO NURSING PRACTICE, 2/e tightly links pharmacology to nursing practice and patient care, recognizing that for nurses, pharmacology is not an abstract academic discipline but rather a critical tool to prevent disease and promote healing and wellness. It offers unsurpassed features designed to illuminate connections between pharmacology and practice, from patient scenarios and practice applications to coverage of lifespan considerations, patient education, alternative therapies, and gender/cultural influences. Nine additional units illuminate the actions of individual drugs on each body system and disease. Learning is simplified through the use of prototype drugs, as well as outstanding full-color illustrations, complemented by 45 web-based animations. This edition covers 30+ new drugs, and offers updated information about dosages, indications, and adverse effects throughout, including Black Box Warnings.